The concept behind the "disability freeze" is simple but powerful. For entitlement to regular Social Security retirement or survivors benefits a worker needs a minimum number of years of covered employment. In addition, the benefit amount is computed based on the average indexed earnings of the worker over his/her working lifetime. One consequence of a period of disability is that the worker will have years of little or no earnings. These years, if taken into account in computing a retirement benefit, would reduce, and in some cases eliminate entirely, future potential retirement benefits. So the disabled individual suffers a "double whammy." They lose the ability to earn a substantial living from employment, and they might also lose their future Social Security retirement benefits. To prevent this, the disability freeze provisions, in effect, ignore periods of disability when computing a retirement or survivors benefit. Thus, the individual is "held-harmless" as far their potential entitlement to other types of Social Security benefits. To qualify for a disability freeze, a person must be found disabled under the same definitions and with the same rigor required for the later cash benefits program. Once Congress saw that the disability freeze program was workable and presented no insurmountable problems of administration, it was more favorably inclined to enact cash disability benefits--which it did two years later. 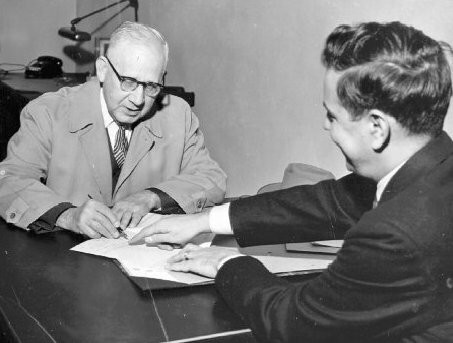 Mr. William Calvin King (left) signs the first application for a disability freeze at 8:17 a.m. EST on January 2, 1955, in the Wheeling, West Virginia Social Security Office. The office Manager, Edgar Allen Poe (yes, that was his real name!) is shown assisting with the application. SSA History Archives.